For employers, the GRN Coastal College Hire program is all about streamlining the College Recruitment process and reducing your costs. Our process has been built by professionals that have engaged in on-campus recruiting for many years. Our goal is to reduce your cost and time associated with College recruitment and still deliver top talent but for a fraction of your overall costs and time. For students, this is a program which connects top college talent with top employers. GRN Coastal partners with colleges and helps their students get their first job in dynamic organizations that present career paths. Employers are current clients and the services we provide students are free of charge. Our firm’s vision is to make a lasting impact on young college graduates and the companies they will work for. We believe success is reached by empowering them to reach for their dreams. WE CAN HELP! We are committed to helping College students via our U Edge program and we help Student Athletes achieve their peak performance in the professional field upon graduation via our Athletes Edge program. We help employers grow with fresh new talent. At GRN Coastal we have developed our College Hire Program™ in conjunction with our clients, actual college students and athletes. We understand their needs. We believe that employers need to shift from a mindset focused on real world work experience and qualifications to one that encourages graduates to broaden their horizons; to be molded and grow within a company and its culture, to help create solutions to industries biggest challenges that only fresh millennial minds will have. We empathize with graduates and their potential employers. For employers, a college hire program is a necessary need in preparing for the future and inevitable change. We believe that top employers must find different ways to engage with potential graduates before graduation and do it more often, more cost effectively with an easier process. For Employers, the value we bring is a streamlined process which has been proven to save time and money. We deliver top talent rapidly and your costs are reduced dramatically. For Students, the value we bring is the real world expertise that the student and student-athlete cannot get on campus or online. For Athletes, we have the athlete background. We’ve “been there, done that”. We’ve been in corporate management and have hired entry-level roles. We are full time recruiters and former College Athletes. As recruiters we view 100’s of resumes. We look at 100’s of LinkedIn and CareerBuilder profiles each week. We talk to clients and candidates every day of the week. We know what employers are looking for. We know Industry trends. 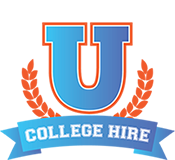 We work with companies that desire college students / athletes for new hires. Lastly and most important, we have the personal contacts to get the Student the interview and first look. Their resume will not be in the stack of hundreds…it will be on top with our personal recommendation to our contracted clients. Is your current method of bringing college talent into your organization cost effective? Is your current method of bringing college talent into your organization time consuming? How many times have you been to an industry event and noticed how much of an aging workforce you are in? How much do you worry about replacing employees who have become near retirement? Does new technology concern you, can your current workforce keep pace with e-commerce…do you need fresh ideas and energy…could a new perspective on your business help? Today’s Millennials and college graduates are the answer to these questions. Educated with tools and curriculums that boomers are envious of, this new workforce is a different breed and they can bring your company to a whole new level and GRN’s College Hire program can locate the top talent quickly and more cost effectively. ABOUT GLOBAL RECRUITERS NETWORK (GRN): We have a global recruiting presence with almost 200 locations across North America and have placed candidates in over 20 countries across the 5 continents. Our locations are all interconnected and we have the ability to share searches via an internal Exchange Network with any location, thus extending our reach and minimizing the time to fill positions. GRN Coastal is an award winning firm. GRN Coastal was the 2014 GRN Rookie of the Year office and 2014 Top Producer award winner. We are consistently ranked amongst the top producing offices in North America.